All information transferred to the drives is encrypted in real-time with an on-board hardware encryption engine. This protects it from any possible unauthorized access or if the drive is lost or stolen. All of the drives automatically lock when they are unplugged from the main computer or if power to the USB port is turned off. The dives operates right out of the box, they don’t require any special software or drivers to be installed and they are all compatible with MAC, PC’s, Linux and other embedded systems. The drives all deliver drag and drop encryption, plug and play ease and can be used with any standard off -the -shelf backup software. 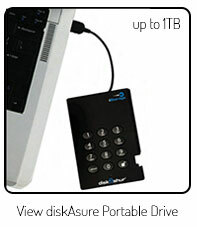 The drives can be set up with independent User and Admin codes, making it perfect for corporate or government use. If the User forgets the pass code PIN, the drive can be unlocked using an Admin PIN which will clear the old User PIN and allow the User to set a new PIN. The drives also incorporate drive capability reset which clears both User and Admin PINs, removes the data, creates a new random encryption key which allows the drive to be reused. All drives are capable of generating an infinite number of randomly generated encryption keys. This allows the user to reset the drive whenever required. Since the iStorage drives are unlocked by the on-board keypad and not by a computer keyboard, they are not vulnerable to software and hardware based key-logging or brute force attacks. The drives protect data with a “Brute Force Hack Defence Mechanism”, which will delete the encryption key and will destroy all stored data when the incorrect PIN is entered a 10 times consecutively. Interesting fact: Millions of flash drives are lost or stolen every year and the disturbing figure is rising. Consider the impact of losing your non encrypted USB external drive? Your data is totally at the mercy of anyone who finds it. In Europe, for example, the Information Commissioner’s Office (ICO) now has the power to significantly fine and business or government entities for serious breaches. It’s expected that these fines will soon be employed in the United States as well. This includes the loss of an unencrypted drive that contains client data. The ICO has is clear in advising businesses and government to encrypt all the data that workers access, they recognise that data which is encrypted and lost or stolen is not vulnerable to compromise. Loss of confidential data has devastating effects on businesses and consumers. It could lead to a very large fine, the ruin of a business, embarrassment, loss of jobs and bad media attention. The iStorage drives can protect you any this. Our drives are investments that last for years. They are rugged extruded aluminium, have water proof casings, are tamper evident and protect it against physical damage. The drive components are sealed with a tamper proof coatings.